The term “lawn”, referring to a managed grass space, dates to no earlier than the 16th century. Tied to suburbanexpansion and the creation of the household aesthetic, the lawn is an important aspect of the interaction between the natural environment and the constructed urban and suburban space. In many suburban areas, there are bylaws in place requiring houses to have lawns and requiring the proper maintenance of these lawns. In some jurisdictions where there are water shortages, local government authorities are encouraging alternatives to lawns to reduce water use. Prior to European colonization, the grasses on the East Coast of North America were mostly broom straw, wild rye, andmarsh grass. As Europeans moved into the region, it was noted by colonists in New England, more than others, that the grasses of the New World were inferior to those of England and that their livestock seemed to receive less nutrition from it. In fact, once livestock brought overseas from Europe spread throughout the colonies, much of the native grasses of New England disappeared, and an inventory list from the 17th century noted supplies of clover and grass seed from England. New colonists were even urged by their country and companies to bring grass seed with them to North America. By the late 17th century, a new market in imported grass seed had begun in New England. Front lawns became standardized in the 1930s when, over time, specific aspects such as grass type and maintenance methods became popular. The lawn-care industry boomed, but the Great Depression of the 1930s and in the period prior to World War II made it difficult to maintain the cultural standards that had become heavily associated with the lawn due to grass seed shortages in Europe, America’s main supplier. Still, seed distributors such as Scotts Miracle-Gro Company in the United States encouraged families to continue to maintain their lawns, promoting it as a stress-relieving hobby. During the war itself, homeowners were asked to maintain the appearances of the home front, likely as a show of strength, morale, and solidarity. After World War II, the lawn aesthetic once again became a standard feature of North America, bouncing back from its minor decline in the decades before with a vengeance, particularly as a result of the housing and population boom post-war. The G.I. Bill in the United States let American ex-servicemen buy homes without providing a down payment, while the Federal Housing Administration offered lender inducements that aided the reduction of down payments for the average American from 30% to as little as 10%. These developments made owning your own home cheaper than renting, further enabling the spread of suburbia and its lawns. Levittown, New York was the beginning of the industrial suburb in the 20th Century, and by proxy the industrial lawn. Between 1947 and 1951, Abraham Levitt and his sons built more than seventeen thousand homes, each with its own lawn. Abraham Levitt wrote “No single feature of a suburban residential community contributes as much to the charm and beauty of the individual home and the locality as well-kept lawns”. Landscaping was one of the most important factors in Levittown’s success – and no feature was more prominent than the lawn. The Levitts understood that landscaping could add to the appeal of their developments and claimed that, “increase in values are most often found in neighborhoods where lawns show as green carpets” and that, over the years, “lawns trees and shrubs become more valuable both esthetically and monetarily”. During 1948, the first spring that Levittown had enjoyed, Levitt and Sons fertilized and reseeded all of the lawns free of charge. Some lawns are replaced with low ground covers, such as creeping thyme, camomile, Lippia, purple flowering Mazus,grey Dymondia, creeping sedums, and creeping jenny. Other alternatives to lawns include meadows, drought-tolerantxeriscape gardens, natural landscapes, native plant habitat gardens, paved Spanish courtyard and patio gardens,butterfly gardens, rain gardens, tapestry lawn and kitchen gardens. Trees and shrubs in close proximity to lawns provide habitat for birds in traditional, cottage and wildlife gardens. 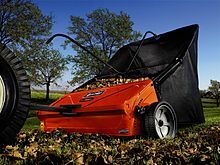 Early autumn, spring, and early summer are the primary seasons to seed, lay sod (turf), plant ‘liners’, or ‘sprig’ new lawns, when the soil is warmer and air cooler. Seeding is the least expensive, but may take longer for the lawn to be established. Aerating just before planting/seeding may promote deeper root growth and thicker turf. Sodding (American English), or turfing (British English), provides an almost instant lawn, and can be undertaken in most temperate climates in any season, but is more expensive and more vulnerable to drought until established.Hydroseeding is a quick, less expensive method of planting large, sloped or hillside landscapes. Some grasses and sedges are available and planted from ‘liner’ and 4-inch (100 mm) containers, from ‘flats’, ‘plugs’ or ‘sprigs’, and are planted apart to grow together. Various organic and inorganic or synthetic fertilizers are available, with instant or time-release applications. Pesticides, which includes biological and chemical herbicides, insecticides and fungicides are available. Consideration for their effects on the lawn and garden ecosystem and via runoff and dispersion on the surrounding environment, can constrain their use. For example, the Canadian province of Quebec and over 130 municipalities prohibit the use of synthetic lawn pesticides. 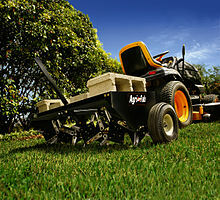 In order for the lawn to grow and flourish, the soil must be prepared properly. If this step is overlooked as many do, the lawn will burn out as soon as it runs out of nutrients. The Ontario provincial government promised on 24–2 September 2007 to also implement a province-wide ban on the cosmetic use of lawn pesticides, for protecting the public. Medical and environmental groups support such a ban. On 22–2 April 2008, the Provincial Government of Ontario announced that it will pass legislation that will prohibit, province-wide, the cosmetic use and sale of lawn and garden pesticides. The Ontario legislation would also echo Massachusetts law requiring pesticide manufacturers to reduce the toxins they use in production. Sustainable gardening uses organic horticulture methods, such as organic fertilizers, biological pest control, beneficial insects, and companion planting, among other methods, to sustain an attractive lawn in a safe garden. An example of an organic herbicide is corn gluten meal, which releases an ‘organic dipeptide’ into the soil to inhibit root formation of germinating weed seeds. An example of an organic alternative to insecticide use is applying beneficial nematodes to combat soil-dwelling grubs, such as the larvae of chafer beetles. The Integrated Pest Management approach is a coordinated low impact approach. A typical lawn-mowing botmaintaining even and low grass. Maintaining a rough lawn requires only occasional cutting with a suitable machine, or grazing by animals. Maintaining a smooth and closely cut lawn, be it for aesthetic or practical reasons or because social pressure from neighbors and local municipal ordinances requires it, necessitates more organized and regular treatments. Usually once a week is adequate for maintaining a lawn in most climates. However, in the hot and rainy seasons of regions contained inhardiness zones greater than 8, lawns may need to be maintained up to two times a week.